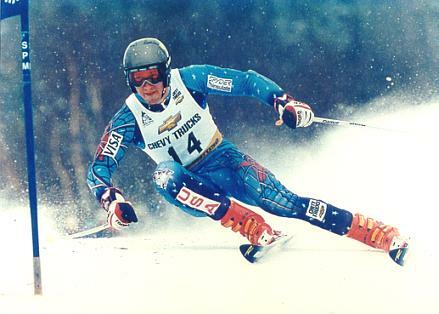 The 1932 and 1980 Winter Olympic Games have firmly established the Adirondacks, and specifically Lake Placid, as the premier winter sports capital of the world. In fact, when it comes to winter sports, there is more to see and do in the Adirondacks that anywhere else on earth!! Where else can a visitor ride to the top of a 120 meter ski jump or hurdle down a refrigerated bobsled track at 60 miles per hour! With hundreds of miles of beautiful backcountry ski trails, cross country skiers can pole their way from village to village stopping along the way to sample delicious homecooked meals at many trailside inns and bed and Breakfast's. For Alpine Skiers, the Adirondacks and Upstate New York boast over 30 ski mountains including Gore Mountain and Whiteface Mountain, offering the steepest vertical drop in the East. In Vermont skiiers can choose from over seventeen major ski resorts including Ascutney, Bear Creek, Bolton Valley, Bromley, Burke ,Jay Peak, Killington/Pico, Mad River Glen, Middlebury Snow Bowl, Mount Snow, Okemo, Smugglers' Notch, Stowe, Stratton, Sugarbush and Suicide six. Enjoy Snowshoeing in the Adirondacks! In the winter the Adirondacks offer world class Winter Sports including Skiing , X-Country , Snowboarding , Hockey, Snowmobiling , Dog Sledding , Ice Fishing , Ice Climbing ,Winter Camping , Skating , Snowshoeing and Bobsledding . Visitors and residents alike enjoy the many fine downhill and cross-country ski areas in the Adirondacks. At Whiteface Mountain, just outside of Lake Placid, you'll find some of the best alpine skiing and snowboarding in North America. It has the greatest vertical drop this side of the Rockies and is the only ski area in the East to have hosted the Olympic Winter Games. Neighboring Vermont boasts challenging skiing at Killington, Stowe & Stratton as well as several other fine ski centers. 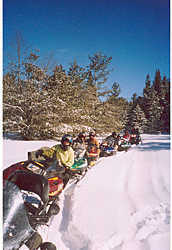 The Adirondack Mountains have the largest, most diverse trail system for snowmobiling in NY State. You can find the most up to date Adirondack snowmobiling trail conditions, information on snowmobile rentals, snowmobile maps, and restaurant locations for riders with just a click of your mouse. From well groomed woodland tracks to lake bed riding - regardless of your level of ability, snowmobiling fun can be found in the Adirondacks! click here for our snowmobile headquarters! CROSS COUNTRY SKIING in the ADIRONDACKS! Cross-country skiing is a great way for the entire family to enjoy the beautiful winter landscape throughout the Adirondack region. Basic skills can be learned quickly and most cross-country ski centers offer rentals and lessons. The Adirondacks offer many low fee or free cross-country trails. Lake Placid is home to world-class skiing at Mount Van Hoevenberg, one of the most well known Nordic ski centers in the country and the Jackrabbit Trail System criss-crosses throughout the area. Whatever your skill level, you can find outdoor adventure in the Adirondacks! In addition to offering you links to Adirondack cross country skiing we also provide links to cross-country ski centers and equipment manufactures around the country. Including Canada, Montana, Idaho and Lake Tahoe. Web Guide to cross country skiing. Cross country skiing vacations and listings of cross country ski lodges in North America. Find great deals on a wide selection of snowboards - compare prices. Snowboarding gear all at deeply discounted prices! Shop a full line of high-performance, easy-to-use snowshoes & snowshoeing gear from Tubbs, Atlas, MSR, Redfeather & more! Compare & save up to 60% everyday on skates, sticks & over 1000 other hockey equipment products in stock for same-day shipment! Search a large selection of hockey gear including womens & youth sized hockey equipment and more! Beautiful 'four seasons' waterfront compound ideal for family reunions, weddings, snow mobile groups & corporate retreats! Perfect for large groups up to 40 people! Book your reservations now for the upcoming winter season! This facility is ideal for large or small snowmobile clubs & groups. Located directly on a main Adirondack snowmobile route connecting to hundreds of miles of snowmobile trails throughout Upstate New York. Home of two of the Jewels of the Northeast; Gore Mountain & Whiteface Mountain. From North Creek to Lake Placid, there are thousands of wonderful Cross Country Ski Trails! Search quality snowmobiles at rock bottom prices! Lifts: 9 total- New 8 passenger Northwoods Gondola, 2 Quads, 1 Highspeed Triple (The Adirondack Express), 3 Doubles, 2 Surface lifts. Services: Two Lodges: Main Base Lodge with dining, Ski & Snowboard School, mountain patrol, nursery, rental shop, accessory and clothing shop, lounge, administration, ticketing; Saddle Lodge at mid-mountain with food service. NYS Thruway to Exit 24. Take I-87 (the Northway) to Exit 23 (Warrensburg). Follow Route 9 for 4 miles to Route 28 and proceed 16 miles to Peaceful Valley Road. Take I-87 (the Northway) to Exit 26 (Pottersville). Follow the Gore Mountain "Trailblazer" signs through Olmstedville then left on Route 28N to North Creek. Make a left turn onto Route 28 and then a right onto Peaceful Valley Road. Take I-87 (the Northway) to Exit 25 (Chestertown). Follow Route 8 west for 11 miles. Turn right in Wevertown on Route 28; proceed north to Peaceful Valley Road. Take I-90 (NYS Thruway) east to Utica. Take Route 8 North from Utica to North Creek. Make a left onto Peaceful Valley Road and continue 5 miles to Gore Mountain. West Mountain - 59 West Mountain Road, Glens Falls, NY 12804. 3 miles west of Northway (I-87) exit 18. (518)793-6606. 1,010 foot vertical drop, 21 trails (beginner, intermediate and expert), 60% snowmaking. Lessons and equipment rental available. Child care and kid-ski programs available. Open daily, Monday through Friday 9:30AM-10:30PM, Saturday and Sunday 8:30AM-6PM. Closed Christmas Day. Tickets are sold for 4 and 8 hour blocks. Garnet Hill Lodge is a four season Adirondack Inn / Resort in the Adirondacks of New York- a summer vacation destination and a complete cross country skiing center in winter. Discover Garnet Hill's spectacular lake and mountain view, distinctive accommodations, superb cuisine and outdoor fun. The 50-kilometer Jackrabbit Trail runs from Keene, through Lake Placid and Saranac Lake, to Paul Smiths. It is a public trail that connects with four ski centers and several backcountry routes along the way. 15K of trail near ski centers are groomed and subject to a trail fee. Over 35K of ungroomed trail sections are free. Trail maps showing access points and fee areas are available at all centers and sport shops. Rates: For $12/day, the Interconnect Pass will allow you to access the following ski centers: Cascade, Lake Placid Resort, Mt. Van Hoevenberg and the Whiteface Club. Call 1-800-447-5224. Season: Open throughout the winter, weather permitting. Click here to order photos of skiers in action at Whiteface Mt. Use the equity in your home to buy your dream vacation home, log cabin or waterfront camp in the North Country. for information on Cross Country Ski Centers throughout the USA and Canada. The base for Packbasket Adventures is our lodge, located on the fabled Oswegatchie River, famous for its scenic beauty, remote wildness and fine sport. The river flows through Wanakena into Cranberry Lake, which has 40 of its 55 miles of shoreline State protected and waiting to be explored. Our newly constructed lodge consists of 4 bedrooms with private baths. Each room is finely appointed in the lodge style, making for a cozy return at the end of the day's adventure. Adirondack Rock & River Guide Service, Inc.
We are the only AMGA accredited, full service guiding establishment based soley out of the Adirondack Park. With two newly renovated lodges located in a secluded mountain valley (open to the general public as well as guided clients), we offer courses, private guiding and group instruction in the disciplines of rock climbing, ice climbing winter mountaineering, and hiking year round. Our relaxed, friendly atmosphere combined with wilderness location makes for a truly unique learning experience! Search and compare the lowest prices for fresh balsam wreaths & hand crafted gifts from all over the country! Free shipping & toll free ordering! gourmet gift baskets with cheese, wine & chocolate! Find corporate gifts, flowers, get well gift baskets, and much more! Enjoy toll free ordering & free shipping! "Turn your old vehicle or boat into a valuable tax deduction and help your favorite charity. All with just one click!" Donate Your Used Vehicle to Charity! Donate your used car, boat, motorcycle, van or RV to your favorite charity & receive full fair market value as a tax deduction! Click here to learn more and search for your favorite charity! Free nationwide pickup and no complicated paperwork. It's fast and easy. All vehicles accepted. Search and choose from hundreds of religious institutions, schools, and charitable organizations including cancer research, multiple sclerosis and heart disease.